Sterling Oliver is accustomed to the surprise she is frequently met with when she walks into a room where a family is grieving. The 26-year-old, named for her great, great grandfather, the founder of H.D. Oliver Funeral Apartments, does not fit the stereotypical image of a funeral director. But her education, which includes earning an Associate of Applied Science in Funeral Service from Tidewater Community College, along with her genuine warmth make her more than capable of handling the plethora of details that accompany the loss of a loved one. Sterling is the daughter of Martin Oliver, owner of the family business that also includes Chesapeake and Virginia Beach locations. The company dates back to 1865, when the original Sterling T. Oliver built caskets during the Civil War. Five generations later, Sterling is immersed in what will one day be a business she and her cousin, HD, will run together. Funeral service is a career she was born into having watched her father keep irregular hours to service a family in need. Neither parent pushed her to follow the path – “In fact, they insisted I go to college first,” said the Maury High School graduate. Oliver earned her bachelor’s in communication with a specialization in event planning and minor in anthropology from Longwood University. She values the communication skills she gained there, as funeral service is not about working with dead bodies. After Longwood, TCC became the next step. She considered following her father’s path and attending the nationally renowned Gupton-Jones College of Funeral Service in Atlanta but found an equivalent program at TCC at more than half the cost. TCC’s 67-credit program combines technical education with business skills under the direction of program head Frank Walton, a funeral service practitioner for more than 25 years, and Kim Jones, associate professor of funeral service who specializes in teaching the sciences. Having come from a small liberal arts college that was close knit, Oliver didn’t expect the same at TCC given its size. “I was prepared to have this impersonal experience, but I was proved wrong,” she said. Walton and Jones remain mentors who impressed her with lively class discussion and quick responses to all her questions. Last May Oliver graduated and is finishing up her apprenticeship, the final step in the program. She will take her state certification exam this summer to be a licensed funeral director. Oliver would like to see more women consider a funeral service career. She works under TCC alumna Angela Gagne, the first female funeral director in H.D. Oliver history. What used to be a male-dominated industry has increasingly tilted toward women. 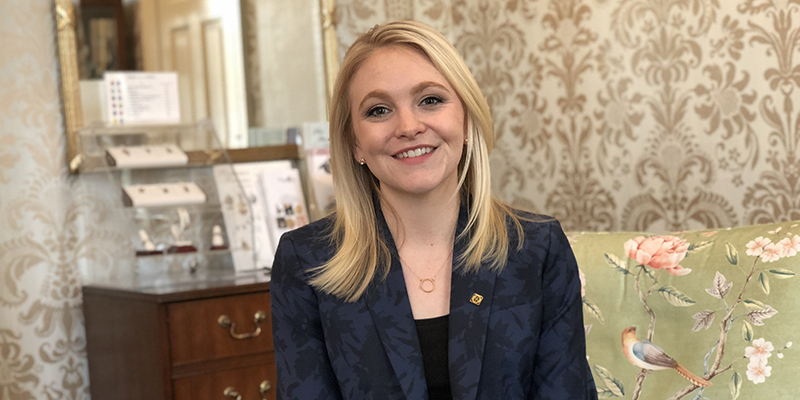 While only 16 percent of all National Funeral Directors Association members are women, today, nearly 60 percent of mortuary science students are female. For information about TCC’s funeral service program, contact Walton at jwalton@tcc.edu.